Did he stab his father to death? That’s the question being debated by 12 men and women who’d rather be anywhere else than in the courtroom. At first it looks like an open-and-shut case: Clearly the man is guilty! But one juror is unsure. Can he convince the other 11? Fat chance, but maybe he can. 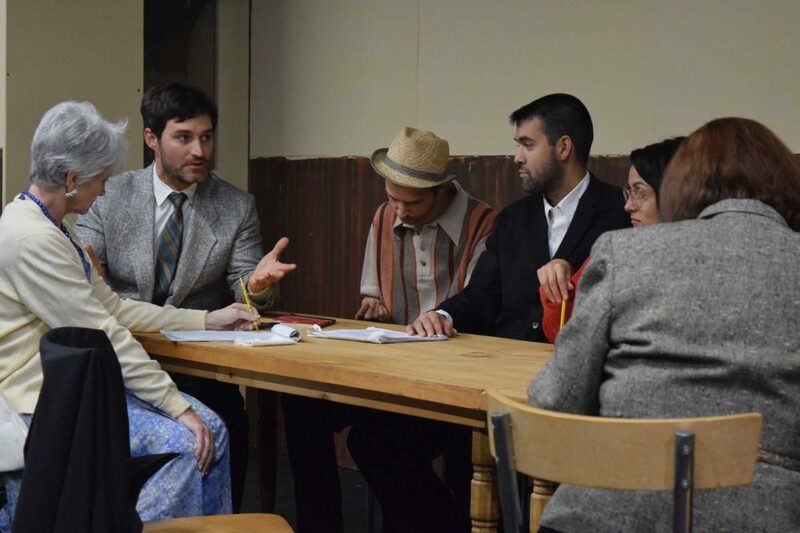 We’ll find out when the play by Reginald Rose, adapted for the stage in 1964 from his 1954 teleplay, opens this weekend at Surf City Theatre in Hermosa Beach. 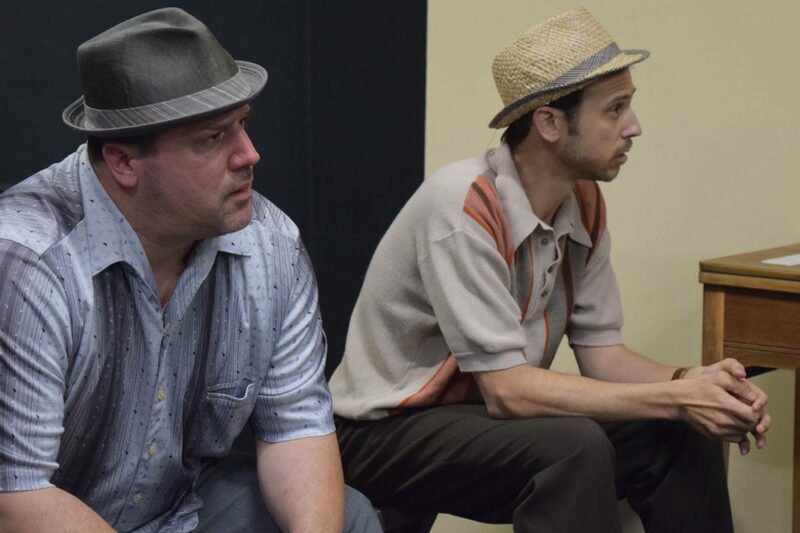 Director Richard Perloff is well known over the hill, in San Pedro, where he often directs for or stars in shows produced by Little Fish Theatre. He was lured to Hermosa by his friend and colleague Diana Mann who had posted on Facebook, “Is there anybody out there interested in directing “12 Angry Men”? And you raised your hand? The play is quite often performed. Perloff selected the actors along with the company’s founder and executive producer Lisa Leonard. 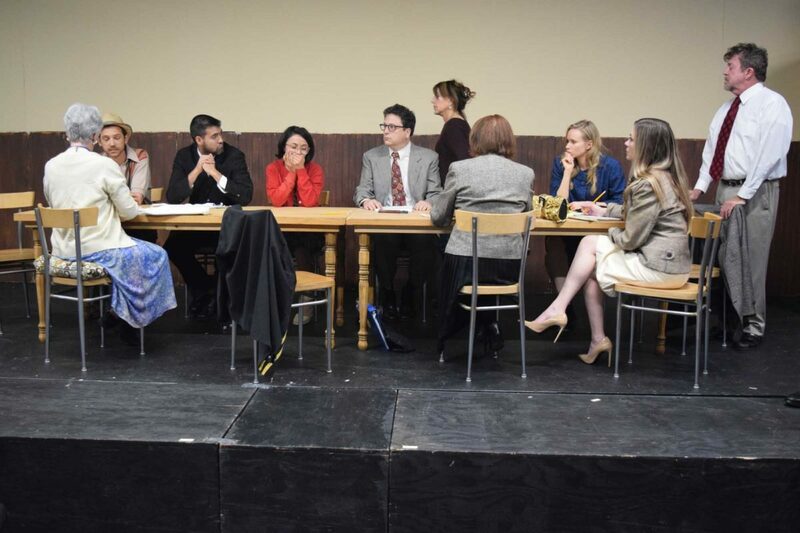 Originally the play was known as “12 Angry Men,” although in recent years, with a mixed gender cast, it’s now often staged as “jurors” instead of “men.” Did Perloff decide on a ratio of men to women before casting began? Watching Perloff during rehearsals, it’s clear that he knows the material and is meticulous about eliciting from his actors precisely what he wants from them. Let’s pull aside Juror #9 and see which way she’s leaning. France is no Johnny or Joanie come lately. But let’s go back a few years. How did she end up in the unusual role as actor/set painter? France says she’s never acted with anyone in the current show, although she knew Perloff because she’d painted sets for Little Fish in San Pedro. She has nothing but praise for the director (which clearly must help when said praise makes it into print). Did you think he wanted you to serve on jury duty, like maybe in downtown L.A.? This is his first time appearing with Surf City Theatre, although he’s been in shows at Little Fish and in the Hollywood area where he lives. He seems to have dug into his Juror #7 character and reached a conclusion: “He’s a jackass. Each character in the show has an archetype, and my character is like the self-involved, can’t be bothered with anyone else’s problems kind of guy. So he makes light of everything. He’s kind of a sleeze, kind of a slick guy who likes to crack jokes and not take anything too serious. As he says, it’s not the sort of role in which he finds himself. “I do a lot of people who have deep existential crises,” Gallai says, pointing out both Shakespeare and Arthur Miller. “Theater is the thing that makes me be alive,” he adds, while also indicating his love of film, a medium in which he’s both acted and produced. However, Gallai says he’s yet to find the satisfaction in film performance that he finds in theater performance.